Fashion Week just started at the Lincoln Center, and we have an eye on the new “campus” where fashion and arts meet. But only one eye ! 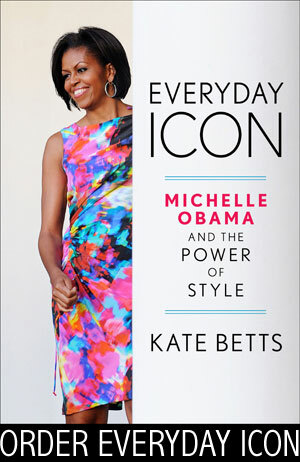 The other is looking toward Washington where the First Lady is crowned Queen of Fashion in “Everyday Icon: Michelle Obama and the Power of Style” (Clarkson Potter) by Fashion journalist Kate Betts. Not so long ago, in a New York Times Oped, Betts defended Michelle Obama who was attacked by the US fashion industry after wearing a Alexander Mac Queen red silk dress at a White House official diner with Chinese president Hu Jintao. Michelle Obama’s impact on fashion extends far beyond the “made in America” label stitched into her dress. (…) Yes, she is sometimes an ambassador for American designers, but more important, she is an ambassador for the self-possession that defines American style. I asked Fashion Director at Lincoln Center Stephanie Winston Wolkoff, a queen ( or rather a princess) of fashion in her own right, what she thought. For her, Michelle Obama has “revolutionized fashion at the White House” where, ever since Jackie Kennedy, fashion was absent from state diners. “Michelle Obama has an incredible following. She has a real sense of style. Most important she wears what she likes”! In the end, New York and Washington are looking in the same direction: the silhouette on the red carpet that will inspire us.